Wauseon third baseman Brady Thomas tags out a Defiance baserunner attempting to steal during the season opener Saturday. A four-run fifth inning for the Bulldogs helped them to a 6-1 win over the Indians. 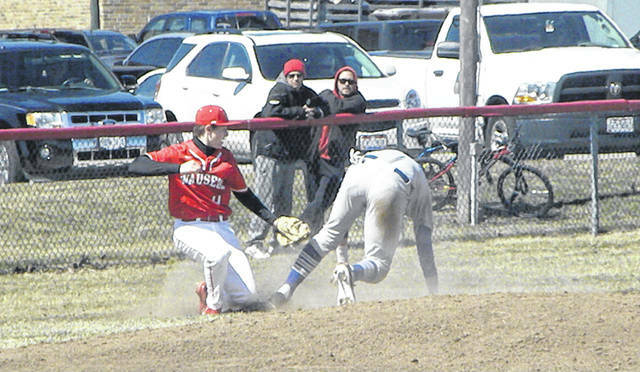 Battling Defiance in a 1-all tie, Wauseon committed a couple errors that allowed the visitors to pull away for a 6-1 win as the two teams kicked off the baseball season Saturday. The Bulldogs broke the game open with four runs in the top half of the fifth inning. After a popped up bunt left runners at first and second, Blayne Robinson delivered a run-scoring single. Trouble continued after that, as a pair of errors led to another run. One came on a rundown. A third error on a dropped fly ball continued the inning and led to the final run of the frame. After getting out of trouble in the top of the fourth, Wauseon was able to tie the game in the bottom of the inning. The Bulldogs had a runner thrown out attempting to steal and left runners at first and second in the top of the fourth. Struggling to make contact against Caden Kline, the Indians scratched out a run in the bottom of the frame. Sean Brock drew a one-out walk, then scored when Joey Shema doubled to right. It all came before a single by Levi Krasula, who was picked off. Shema advanced to third, but he was left stranded. Defiance added a run with a RBI from James Seele in the top of the seventh. Wauseon threatened to score by loading the bases in the bottom of the inning, but back-to-back strikeouts ended the game. Eric Parker took the loss on the mound for the Tribe. He allowed five runs – one earned – on three hits with two walks and four strikeouts in five innings. Shema hit a double and Krasula a single for the Wauseon offense. Wauseon (0-1) plays Monday at Start and will visit Toledo Central Catholic on Tuesday.